I think it’s fair to say that Tatuaje is a household name for cigar smokers these days. Pete Johnson has delivered some insanely good smokes, and some really fun ones too like The Bride (part of the annual Monster series) which we recently reviewed. Up for review today is the Tatuaje 15th Anniversary Habano Rosado, one of the company’s few anniversary releases. The 15th Anniversary also comes in a separate blend featuring a Habano Oscuro wrapper, which I hope to review soon. The Tatuaje 15th Anniversary Habano Rosado is a stunner of a cigar. The white band features raised gold lettering, which makes the cigar stand out in the humidor and gives it a rather celebratory look. The outer rosado claro wrapper has just one, small, visible vein and is otherwise silky to the touch. I also love the closed foot on this cigar (wrapper leaf extending past the foot and folded over). That basically guarantees an extra-flavorful start to the smoke. After cutting the cigar with a straight cut, I test the draw, which is just about perfect (7/10 in terms of amount of restrictiveness). There’s not much to write home about on the cold draw because it’s so light, with some creamy natural tobacco and hints of wood. The aroma off of the foot is much more interesting, with a salt, oak, leather, and some bright spice which prompts not one but two sneezes as I write my notes. The Tatuaje 15th Anniversary Habano Rosado opens more forcefully than I was expecting, with a searing amount of spice and secondary pepper on the first four or five puffs. Smoke production is spot on, and strength and body lands at about medium. Generally, the smoke activates salty and bitter sensations on the palate. More specifically, I pick up oak, dry cedar, and an array of semi sweet baking spices (cinnamon, nutmeg) and light creaminess. Not a bad start, but quite a bit to handle from that closed foot. As the ember burns past the first half inch, the spice and pepper draw down substantially. This gives much more of the spotlight to those baking spices, almonds, cream, and a slight lemon peel note. The retrohale is a solid medium, with nicely balanced notes of toasted bread and spices. In the second third, the Tatuaje 15th Anniversary Habano Rosado settles way down at just above mild in terms of body and strength, and really hits its stride. The texture of the smoke is extremely smooth, with a profile dominated by warm bread, assorted nuts, cappuccino, and some light, slightly bitter leather. It’s a far cry from the aggressiveness of the first third, but much more balanced and enjoyable in my book. The construction up to this point in the cigar has been good but not great, with the burn straying two or three times and requiring a few purges to correct. 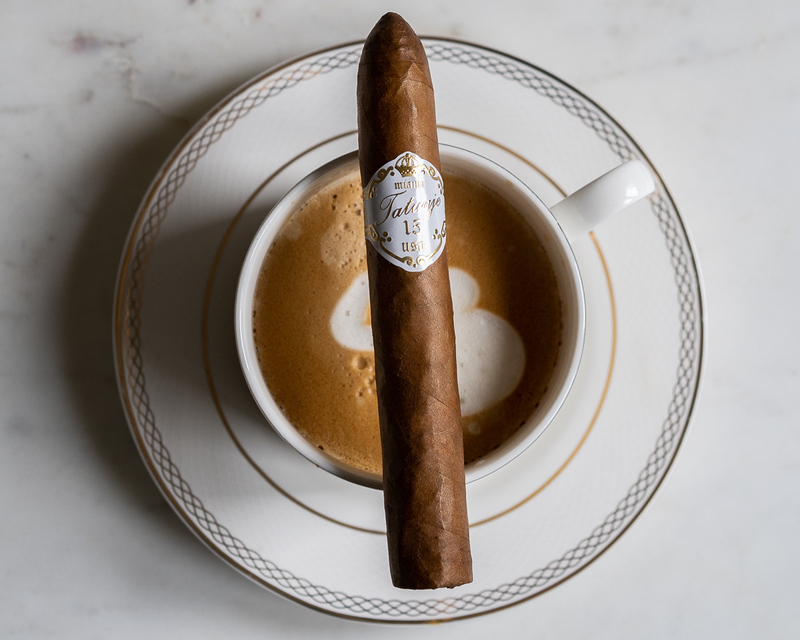 Still, even with the lightness of the profile it’s clear this cigar would pair incredibly well with coffee or espresso. The final third continues most of the developments of the second, with a primary focus on toasted bread, light baking spices, and an overall mild strength. Some wood, salt, and sweet floral notes make occasional appearances as well. And thankfully the construction issues that degraded the earlier experience are nowhere to be found. Construction issues aside, the Tatuaje 15th Anniversary Habano Rosado is a solid morning or early afternoon smoke, and worthy addition to the company’s portfolio. It puts forward a decently complex, well balanced experience that highlights flavors of toasted bread, baking spices, assorted nuts, and coffee notes. And as mentioned would pair remarkably well with coffee or espresso.